It was a beautiful Spring day in central Indiana. Temps in the 50's with sunshine. Today was a short (8 hours) day for me, so we took advantage of it and walked the dogs, which we haven't been able to do much lately, because of my hours, weather, and lack of daylight. 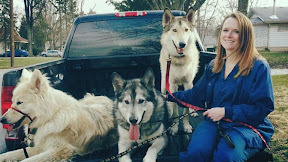 Afterwards, the woofers and I were sitting in the back of the truck, and Les snapped a cell pic of us. Have a happy Easter weekend guys! Easter I plan to boil some eggs and hide in the yard and let dogs find them.. Never done that before, but they love eggs cooked or raw.